Our range of products include autoelectric tl866a universal ic programmer, universal ic programmer - autoelectric tl866-ii, universal ic programmer - autoelectric tl866cs and 8051 usb programmers. This is MINI PRO USB TL866A UNIVERSAL EEPROM PROGRAMMER | ISP | ICSP | SPI | MCU | GAL. 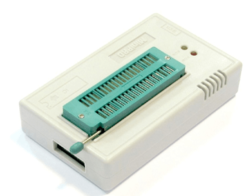 It Supports a wide range of chips: 26, 27, 28, 29, 37, 39, 49, 50 parallel ROM, EPROM, EEPROM, 24, 25, 35, 85, 93, 95 Series EEPROM, Serial parallel ROM chips, fully supporting the 48-PIN chips upto 64Mbits capacity. It also supports a variety of models of 51 series of microcontroller, AVR microcontroller, including ATMEGA series, ATtiny Series, AT90XXX Series MCU, MICROCHIP PIC10 PIC12 PIC16 PIC18 MCU, programming of GAL programmable logic device, SRAM test, 54/74 and CMOS4000 series IC comprehensive function tests. 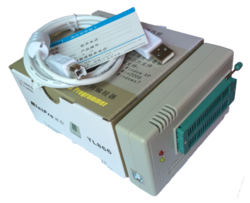 Unique universal serial programming interface ICSP (Only TL866A supports this feature, TL866CS cannot use this function). This TL866A programmer can program through the 40-PIN universal socket and is provided with an ICSP programming port for some in-circuit programmable chips, you can program MCU by choosing ICSP port. Supports thousands of popular devices (13,000). This Universal Programmer Autoelectric TL866CS is compact size, low power consumption, high reliability. It Programmer supports more the 6000 Chipset.